Esther was born in Beegden, the Netherlands, on March 13 in 1973. After the secondary education, she started in 1989 her intermediate vocational education on laboratory work, with the main subject clinical chemistry and haematology. She had her traineeship at the Maasland Hospital in Sittard, where she did routine work on blood and urine samples. It was fun, but not what she wanted to do her whole life, so she began with the higher vocational education on laboratory work in 1993, main subject biotechnology. She graduated in 1997. Also in 1997 she started her first job, at the RWTH Klinikum in Aachen, Germany, at the department of Urology. She particularly made sections from different kinds of paraffin-embedded tissues and did histological staining procedures, isolate leucocytes from whole blood and bone marrow, and from these leucocytes she isolate RNA for PCR analysis. After more than two years she switched to another department. She isolated monocytes from fresh buffycoats and isolate the RNA for PCR analysis. 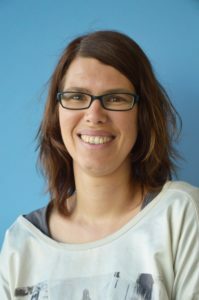 In April 2000 she started at the department of Human Biology, and later on also at the department of Human Movement Sciences, under the supervision of Prof. Schrauwen and Prof. Hesselink. Currently, she does different kinds of techniques, like DNA/RNA isolation, (real-time) PCR, western blotting, immuno-fluorescent assays, bloodanalysis and radioactive work, like oxidation assays and RIA’s.